How do you have your case setup? And yes the Scythe fans will move MUCH more air and be MUCH more quieter :) The SFF120E or F are great fans, but let me know how you have your case laid out. Hard drive bay installed in the upper part or no? 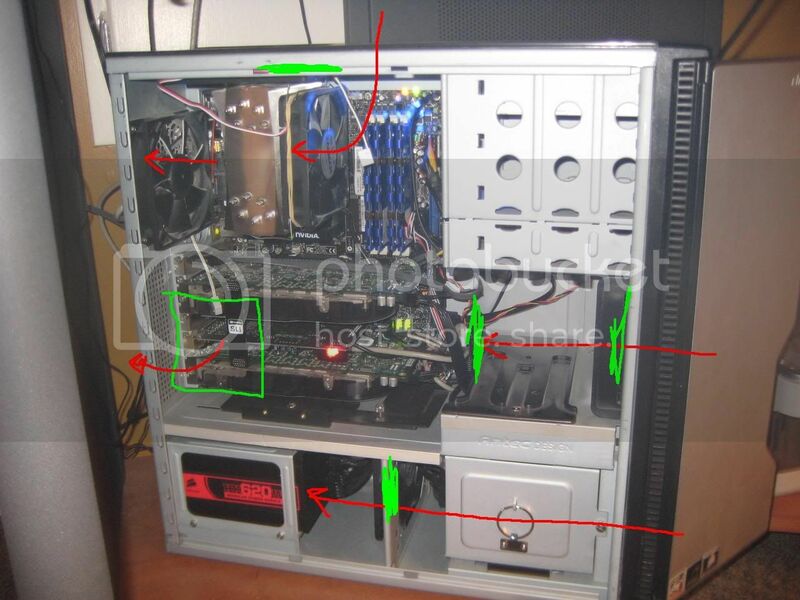 There is a weak picture of my current setup, I have the two antec in the top and back of the case pulling out, one zalman on the heatsink, one zalman in the bottom section of the case pulling air throught the hdd's, and to the p/s, and then a scyth s-flex pulling air into the case where the top hdd cage would go. -I don't know about water blocks for the GPU's and NB's, so I guess I can rsearch them after work for you. This will make your grand total to about $343.00 without the GPU/NB blocks! Sorry if there are any spelling mistakes, my damn laptop has a weird keyboard. Hopefully this will help you out on your quest to water cool! That does help alot, I dont mind paying a bit more (within reason) if I get better results, your post helped alot, so if i go with the pa120.3, would it be best to mount the rad on the top of the case, or use a rad box and have it on the back? Any idea what kind of temps I could expect with everything on th eone rad? Not that I'd want to discourage someone from taking the WC plunge, but it should be quite possible to quiet things down in that case without resorting to water. A big factor is where all your fans are, and what direction they're pointing. That aside, you mentioned that your NB fan was the biggest offender. It might be worth looking into an aftermarket air solution first. And yeah, I have a whole bin full of Tri-cool fans, courtesy of my various Antec cases. First thing I do is rip them off and replace them with Yates or Scythes. Heh with that much ram and SLI in that case its simply no wonder you have all that extra heat. Your gonna wanna replace all the fans with some good ones like the Scythes I mentionted and make sure that they are in all 4 according spots. top, rear, top front and bottom middle. Just saw your photo. Those two top fans are doing exhaust duty, right? Do you have a fan mounted on the bracket in the middle bay? That case needs a little bit of help getting air into it, and a fan in that location can blow air right across the backs of the GPU's. Any ideas on aftermarket northbridge coolers? I was looking at the thermalright one, but it looks as though I'll have to strap a 80mm fan to it, and then I'll also have to cool my southbridge with hs/fan. Any ideas as to a better solution? Scythe S-FLEX SFF21E 120MM Cooling Fan 1200RPM 20.1DBA 49.0CFM FDB ? Will 49cfm be enough? my antecs are running at the highest setting (79cfm 30db, and if I turn them down to the med setting (56cfm 28db) my temps start to climb... and will 8db difference really make a noticable difference? yes, I have a 120mm pulling air in there across the gpu's, and the top fans are doing exhaust duty. The Thermalright HR-05 series will cool your northbridge fine, and more than likely you won't need a fan on it. I used to use mine passive on my NF4 SLI chipset, and it stayed well below 50 degrees. Plus there is enough cooling in that area that a fan should not be needed. The top one should be blowing into the case to allow more air into it and help your cpu and northbridge keep cooler. even though I have my cpu heatsink fan pushing air to it? Wouldnt that kind of slow down the airflow? my top fan is pumping out all kinds of hot air atm. Top fan blowing down will also help with providing additional air to your ram. I've added another fan just behind the cards to allow the air thats being pulled in from the front fan to be effectively pushed across the cards more with cooler air. I've drawn in a another fan that can be "cable tied" to the square holes on the back to pull hot air away from the cards and out the back. With what you have in that case watercooling will be too difficult and better to ugprade to a bigger case.